Vibrating internal trays and a fine mesh screen, together with air flow, separate fines and chaff from grains; fibers, dust and wood flour from wood chips/shavings; fines, angel hair, strands and film scrap from plastic pellets/regrind; labels from recycled glass, and other undersize and low bulk density matter from on-size products. 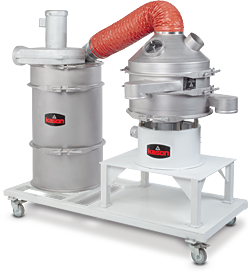 MILLBURN, NJ — A new Vibro-AirTM Size/Density Separator from Kason Corporation employs vibratory screening to remove undersize particles, and airflow to simultaneously remove low bulk density materials, it was announced by Henry Alamzad, president. 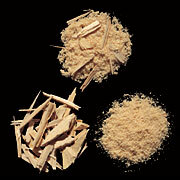 It is said to efficiently separate: fines and chaff from grain products; fines, angel hair, strands and film scrap from plastic pellets/regrind; labels from recycled glass; fibers, saw dust and wood flour from wood chips/shavings; and other undersize and low bulk density matter from on-size products. through a discharge port at the screen's periphery. Heavier fines and a portion of the lighter fines pass through the screen onto a chute leading to a lower discharge spout. Simultaneously, air drawn into the base of the air-tight chamber flows upward, drawing the balance of low density fines, along with airborne dust, fibers, films and strands, into an airstream that increases in velocity (as the hood tapers) before venting to a cyclone and/or dust collector. "The combination of air flow and vibration removes a greater portion of fines and low density materials from on-size particles with higher efficiency than possible with screening alone," says Alamzad. screen to scalp oversize particles from on-size material. The separator is available in 24 to 100 in. (610 to 2540 mm) diameters, in carbon steel or stainless steel, and is offered as a stand-alone unit or a complete system integrated with a dust collection system, exhaust fan and electrical controls on a mobile frame, ready to plug in and run. 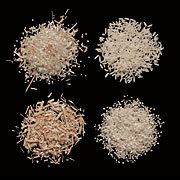 Rice shown (clockwise from top left) as 1) mixture of on-size grains, undersize grains, and chaff, 2) on-size grains, 3) undersize grains, and 4) low bulk density chaff — as separated by screen vibration and airflow. 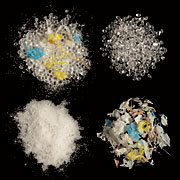 Plastics shown (clockwise from top left) as 1) mixture of on-size pellets, undersize powder and low bulk density film, 2) on-size 3) low bulk density film, and 4) undersize pellets, powder — as separated by screen vibration and airflow. Wood shown (clockwise from top) as 1) mixture of undersize chips and powder, 2) low bulk density powder, and 3) on-size chips — as separated by screen vibration and airflow.